Watch the big announcement on July 22 on Twitch! After many fansites like us received invitations to a special event on July 22, Blizzard officially announce a special event hosted in San Francisco. The event will be available live on Twitch directly ! You are cordially invited to witness a proclamation of grand proportions! Tune in to the official Hearthstone Twitch channel or join us in-person at the Folsom Street Foundry in San Francisco, CA, on July 22 starting at 2:30 p.m. PDT for a few very special Hearthstone matches, shop-talk with developers, and one momentous announcement! The evening will be hosted by Rachel ‘Seltzer’ Quirico, and will also feature well-known Hearthstone community members Frodan and Kripparrian, along with Hearthstone game director Eric Dodds. Be sure to keep your eyes open for a few other guests as well—there’s no telling what else might be in the cards for this event. If you’re thinking of attending in person, consider joining the event page on Facebook to plan your journey now. Space is limited, so get there early! Guests in attendance will be able to pull up a chair and take part in friendly duels of their own as well as enjoy delicious refreshments after the presentation comes to a close. It’s sure to be a rousing gathering full of good cheer and exciting news that you won’t want to miss. We’ll see you there! The Argent Tournament, the next Hearthstone expansion? Yesterday, a new entry on the Inkeeper’s journal has appeared on the official Hearthstone website. 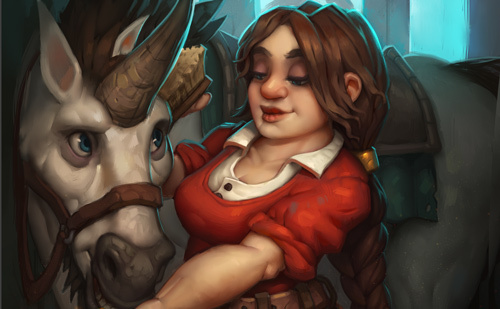 This one told the arrival of new heroes inside the tavern, wearing shinning armors (among them even murlocs), but also the apparition of… a unicorn? This story seems to put foward a theory that we already announced, the announcement of a new Hearthstone expansion based on the Argent Tournament. For the one not present back in Wrath of the Lich King, the Argent Tournament was an event linked to the 3.2 patch : The Call of the Crusade. During that period, players could accomplish feats like a joust tournament or discover the Trial of the Champion and of the Crusader, respective dungeon and raid of the patch. But the simple notion of the unicorn is also a hint (with just below a visual of the mount in question), the Quel’Dorei steed. And lastly the music that fansites like us that when opening the invitation scroll could hear a recurring music of the Call of the Crusade. The Inn is the kind of place that will always welcome anyone and everyone who’s willing to play fair and have fun, so we get all sorts here. Still. . . Some crowds leave a real impression! Today was somethin’ else! The air was filled with the happy hubbub of folks dueling away and enjoying one another’s company, no matter where they hailed from; nothing too out of the ordinary. The funny thing was, most of ‘em were wearing the shiniest armor you ever saw—including the magic-using types! I even saw murlocs all geared up in plate, clankin’ about like wee fishy-smellin’ mechs. 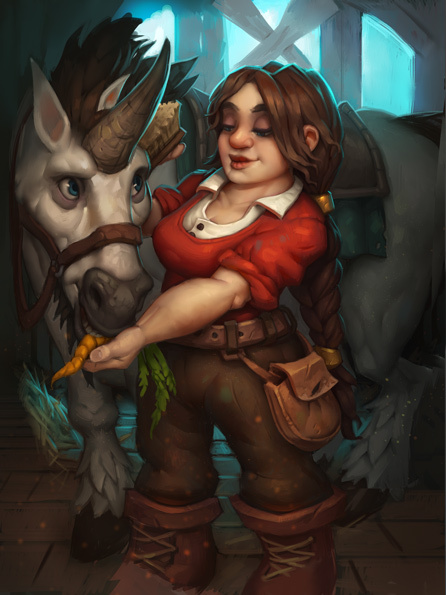 I’ll never forget the young Dwarven lass leadin’ a majestic unicorn around the common room! That seemed to make the other patrons nervous, since getting impaled is usuallyinconvenient, but they had nothin’ to worry about. Soon enough, everyone finished their brews (even the unicorn! ), wrapped up their Hearthstone games, and got back to whatever journey they were on. It was an inspiring sight, and I admit that I was sorry to see ‘em go. I have to wonder where they were all headed. Of course, the Inn has a knack for putting itself right where the excitement is, so I reckon I’ll be findin’ out soon enough!